As I mentioned at the end of my recent head cheese post, there was a sandwich in my future. I didn’t have all of the ingredients that were available to Peter, but I figured I could replicate his basic intent. 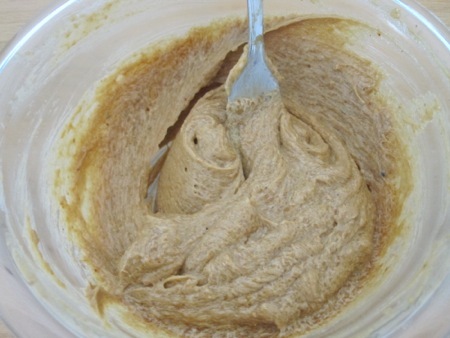 To begin with, I’d have to approximate his black trumpet mushroom/black peppercorn compound butter, which I did with a combination of butter, white miso, shichimi togarashi, and a generous blob of Marmite. I didn’t have any fresh pork belly (for once), but I did have a slab of maple-miso cured bacon, which I sealed with the butter and heated at 65°C for two hours. 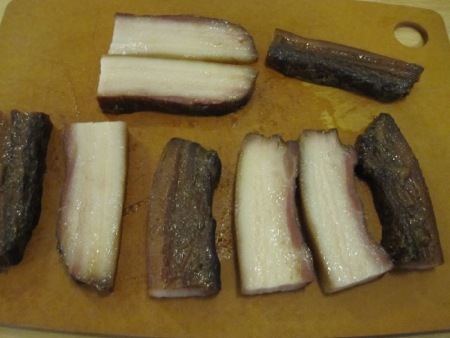 Once cooked, I sliced the bacon into thick chunks and set it aside while I prepped the rest of the ingredients. 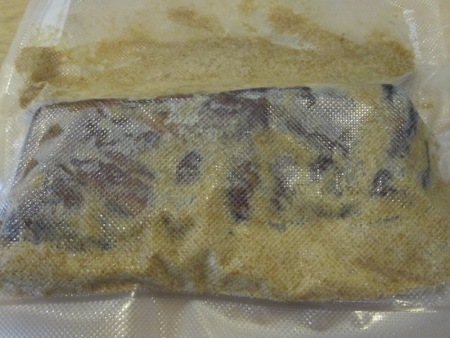 The liquid that had collected in the bag was drained into a saucepan for further modification. 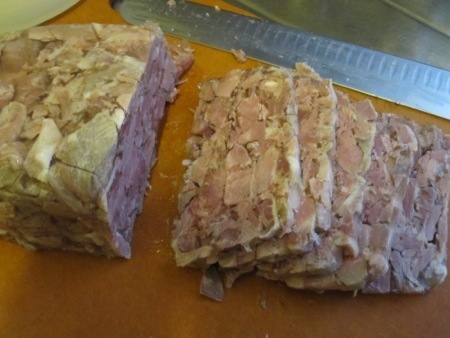 I cut equally thick slices of the head cheese and let it come up to room temperature. 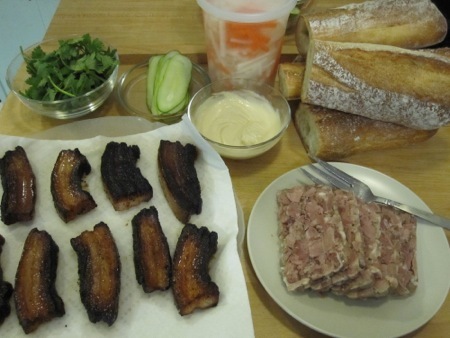 While the bacon was sitting in the water bath, I made a quick pickle of daikon and carrot, cut long thin slices of pickling cucumber on a mandolin, washed and picked some cilantro, sliced two baguettes into thirds, and mixed about a tablespoon of Maggi seasoning into a half cup of mayo. I gave the pork slices a quick char in a grill pan and was ready to make sandwiches. 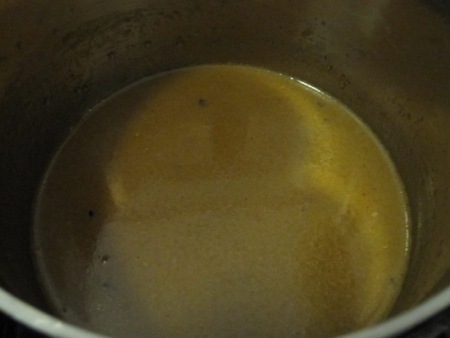 I also warmed up the cooking liquid from the sous vide step, letting it thicken slightly. I tasted it a few times and realized it was a bit salty, so I added a splash of Chinese black vinegar to counterbalance the salt. 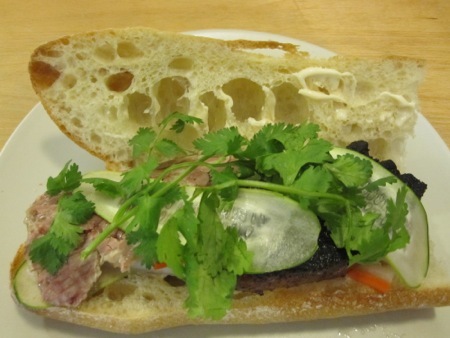 I spread mayo on the baguettes, layered the carrots and daikon, then the head cheese and bacon, followed by the cucumber and cilantro. I served the sandwiches accompanied with the miso butter sauce and the mandatory bottle of sriracha. This was by no means a traditional banh mi, but it had all of the necessary elements: rich, fatty pork, crisp pickles, creamy mayo, and crusty bread. It also had smoke and heat and bacon, but what elevated it above being a mere sandwich was the wonderful sauce, whose saltiness and depth played perfectly against the cold head cheese (which can never be seasoned enough for my taste). Once those sandwiches hit the table, very little talking happened until they were gone. Can I get on the waiting list to marry you? There’s no waiting list, but you’d have to get past She Who Must Be Obeyed.